(Abraham Stoker), 1847–1912, English novelist, b. Dublin, Ireland. He is best remembered as the author of Dracula (1897), a horror story recounting the activities of the vampire Count Dracula and those who oppose him. 1431?–1476, prince of Walachia (1448, 1456–62, 1476), known as Vlad the Impaler. He was the son of Prince Vlad Dracul (Vlad the Devil) and is therefore also called Dracula or son of the Devil. Bela Lugosi’s cinematic interpretation of Dracula from the 1931 classic film based on the Bram Stoker novel. Dracula, the title character in Bram Stoker‘s 1897 novel, set the image of the vampire in the popular culture of the twentieth century. Stoker took the rather vague and contradictory picture of the vampire that had emerged from the nineteenth-century literature and earlier times and developed a fascinating, satisfying, and powerful character whose vampiric life assumed mythic status in popular culture. His face was a strong—a very strong—aquiline with high bridge of the thin nose and peculiarly arched nostrils; with lofty domed forehead, and hair growing scantily round the temples, but profusely elsewhere. His eyebrows were very massive, almost meeting over the nose, and with bushy hair that seemed to curl in its own profusion. The mouth, so far as I could see it under the heavy moustache, was fixed and rather cruel looking, with peculiarly sharp white teeth; these protruded over the lips, whose remarkable ruddiness showed astonishing vitality in a man of his years. For the rest, his ears were pale and the tops extremely pointed; the chin was broad and strong, and the cheeks firm through thin. The general effect was one of extraordinary pallor. Hitherto I had noticed the backs of his hands as they lay on his knees in the firelight, and they had seemed rather white and fine; but seeing them now close to me, I could not but notice that they were rather coarse—broad, with squat fingers. Strange to say, there were hairs at the centre of the palm. The nails were long and fine, and cut to a sharp point. As the Count leaned over me and his hands touched me, I could not repress a shudder. It may have been that his breath was rank, but a horrible feeling of nausea came over me, which, do what I would, I could not conceal. The Count, evidently noticing it, drew back; and with a grim sort of smile, which showed more than he had yet done his protuberant teeth, set himself down again on his own side of the fireplace. We were both silent for a while; and as I looked towards the window I saw the first dim streak of the coming dawn. There seemed a strange stillness over everything…. … I had hung my shaving glass by the window, and was just beginning to shave … This time there could be no error, for the man was close to me, and I could see him over my shoulder. But there was no reflection of him in the mirror! … but at that instant I saw that the cut had bled a little, and the blood was trickling over my chin. I laid down the razor, turning as I did so half-round to look for some sticking plaster. When the Count saw my face, his eyes blazed with a sort of demonic fury, and he suddenly made a grab at my throat. I drew away, and his hand touched the string of beads which held the crucifix. It made an instant change in him, for the fury passed so quickly that I could hardly believe that it was ever there. Slowly, Dracula’s unusual nature became a matter of grave concern, not just a series of foreign eccentricities. Harker dutifully noted that “I have yet to see the Count eat or drink….” And in light of the bizarre situation in which he had been entrapped, he wondered, “How was it that all the people at Bistritz and on the coach had some terrible fear for me? What meant the giving of the crucifix, of the garlic, of the wild rose, of the mountain ash? Bless that good, good woman who hung the crucifix round my neck….” The next day Harker began to gain some perspective on Dracula. He asked him about Transylvania‘s history, and Dracula responded with a spirited discourse. Dracula resided in the mountainous borderland of Transylvania, an area that centuries earlier had been turned over to the Szekelys, tribes known for their fierceness and effectiveness in warfare. Their role was to protect Hungarian territory from invasion. Dracula spoke as a boyar, a feudal lord and member of Hungarian royalty, “We Szekelys have a right to be proud, for in our veins flows the blood of many brave races who fought as the lion fights, for Lordship.” In chapter 3, during his encounter with the three women who lived in the castle, Harker noted other revealing facts about Dracula. While his cheeks were red with rage, his eyes were blue, but as his rage grew, his eyes also became red with the flames of hell behind them. … who was it but one of my own race who as Voivode crossed the Danube and beat the Turk on his own ground! This was a Dracula indeed. Who was it that his own unworthy brother, when he had fallen, sold his people to the Turk and brought the shame of slavery on them! Was it not this Dracula, indeed, who inspired that other of his race who in a later age again and again brought his forces over the great river into Turkeyland; who, when he was beaten back, came again, and again, and again, though he had come alone from the bloody field where his troops had been slaughtered, since he knew that he alone could ultimately triumph…. … I saw the whole man slowly emerge from the window and begin to crawl down the castle wall over that dreadful abyss, face down, with his cloak spreading out around him like great wings…. … I have not yet seen the Count in the daylight. Can it be that he sleeps when others wake, that he may be awake whilst they sleep! Finally, he made a definitive observation that completed the picture of Dracula as a vampire. In chapter 4, he discovered Dracula in his daytime sleep. There, in one of the great boxes, of which there were fifty in all, on a pile of newly dug earth, lay the Count! He was either dead or asleep, but I could not say which—for the eyes were open and stony, but without the glassiness of death—and the cheeks had the warmth of life through all their pallor, and the lips were as red as ever. But there was no sign of movement, no pulse, no breath, no beating of the heart. I bent over him, and tried to find any sign of life, but in vain. … There lay the Count, but looking as if his youth had been half-renewed, for the white hair and moustache were changed to dark iron-grey; the cheeks were fuller, and the white skin seemed ruby-red underneath; the mouth was redder than ever, for on the lips were gouts of fresh blood, which trickled from the corners of the mouth and ran over the chin and neck. Even the deep, burning eyes seemed set amongst swollen flesh, for the lids and pouches underneath were bloated. It seemed as if the whole awful creature were simply gorged with blood; he lay like a filthy leech, exhausted in his repletion. Dracula in England: At the end of the fourth chapter, the storyline of Dracula reverted to England, to where the count was en route. Dracula’s intention was to move to London, and reestablish himself, though to what end was not yet revealed. Leaving Harker to his fate in the castle, and carrying with him fifty boxes of his native soil, Dracula traveled to the Black Sea. There he secretly boarded the Demeter, the ship that would take him to his new home. Aboard the Demeter he quietly came out of his box each night and fed on the sailors. One by one the men grew weak, and as the journey continued, they died. Finally, off the shore of Whitby, a town in northern England, a sudden storm called forth by Dracula blew the ship aground. Dracula transformed himself into a wolf and left the derelict ship. The storyline then shifted to two women, Lucy Westenra and Mina Murray, and the men in their lives. Dracula made only fleeting appearances through the rest of the novel. Instead, he hovered as a vague menace, constantly disturbing the natural course of Lucy and Mina’s lives and requiring a cadre of men to search out and destroy him. Dracula attacked Lucy first. He lured her out of her apartment to a seat on the opposite side of the river, where a suicide had been memorialized. He proceeded to bite her on the neck and drink her blood. He next appeared outside her room in the form of another animal, a bat. Meanwhile, having retrieved his boxes of earth from the Demeter, he had them shipped into London, where the novel’s action now moved. Dracula distributed the boxes from his main home at his Carfax estate to other locations around the city. Dracula renewed his attacks upon Lucy, who received a transfusion from her doctor John Seward after each attack. The men who assisted her, however, failed to realize that they were merely postponing her ordeal and her ultimate death and transformation into a vampire. Lucy’s death and Van Helsing’s demonstration of her vampiric powers welded the men into a unit to fight Dracula. Van Helsing was first able to obtain their assistance in killing Lucy with a stake, garlic, and decapitation. He then trained the men as vampire hunters. In this process, in chapter 18, Van Helsing described Dracula and all his powers and weaknesses. A vampire commands the dead and the animals, especially the “meaner things”—rats, bats, owls and foxes. He can disappear at will, reappear in many forms (especially a wolf, a bat, and as a mist), and can alter the weather. Slightly changing the folk tradition, Van Helsing noted that Dracula preyed not upon the ones he loved best, but upon the ones we loved best. Dracula cast no shadow, he did not reflect in mirrors, he could see in the dark, and he could not enter anywhere without first being invited. Dracula had grown strong through his long years of existence. However, his strength was strictly limited during the day. For example, while he could move around during the day, he could transform himself only at the moment of sunrise, high noon, and sunset. He could pass over running tide only at high or low tide. Dracula was somewhat vulnerable. His power was taken away by garlic, various sacred objects (the crucifix, the eucharistic wafer), and the wild rose. He could be destroyed by attacking him in his coffin with a bullet fired into the body, a stake through his body (not necessarily the heart), and decapitation. Van Helsing’s (i.e., Stoker’s) understanding of Dracula was derived primarily from the folklore of vampires in Transylvania/Romania as described by Emily Gerard in her popular travel book, The Land beyond the Forest (1885). Soon after the session where Van Helsing trained the vampire hunters, Dracula attacked and killed R. N. Renfield, the madman who had been trying to become Dracula’s faithful servant. Then Dracula renewed his attack on Mina that had begun earlier in the book. The men broke into her bedroom and found her drinking Dracula’s blood, presumedly the crucial step in becoming a vampire. Those who were merely drained of blood by a vampire simply died. After driving Dracula away, Van Helsing and the men organized by him counterattacked first by sanitizing Dracula’s boxes of native soil. All but one of the 50 were found, and in each a piece of the eucharist was placed. While the men were at work, in the daylight hours, Dracula suddenly appeared in his home in Picadilly but fled after a brief confrontation. With only one box of the refreshing earth left, Dracula returned to his homeland. While he traveled by boat, Van Helsing, Mina, and the men took the train. The final chase led to Dracula’s castle. Arriving first, Van Helsing sanitized the castle, including Dracula’s tomb. Soon thereafter Dracula appeared, with the other men in hot pursuit. Just as sunset approached, and Dracula’s powers were restored, Jonathan Harker and Quincey P. Morris killed him by simultaneously decapitating him (Harker) and plunging a bowie knife into his heart (Morris). The centuries-old Dracula crumbled to dust. Dracula in Films, Drama, and Books: Dracula was well received by the reading public and both filmmakers and dramatists soon saw its potential. Not long after the book appeared, Stoker moved to assert his rights to any dramatic productions by staging a single public performance of Dracula in London. Then, after Freidrich Wilhelm Murnau filmed Nosferatu, a slightly disguised version of Dracula, Florence Stoker asserted her ownership of the dramatic and film rights to her late husband’s novel. The initial dramatic rights were sold to Hamilton Deane in 1924 and the American rights to Horace Liveright three years later. The film rights to Dracula were sold in 1930 to Universal Pictures, which in the 1950s passed them to Hammer Films. Both the stage and film versions of Dracula radically altered the character’s image. Deane dropped attributes of Dracula that would prevent his acceptance by middle-class British society. Thus Dracula lost his bad breath, hairy palms, and odd dress. He donned a tuxedo and an opera cape and moved into the Harkers’s living room. The Universal movie had an even more influential role in reshaping the image. Bela Lugosi’s portrayal in the American stage play was succeeded by others, but in the movie he reached millions who never saw the stage play, and what they saw was his suave, aristocratic European manner and pronounced Hungarian accent. He reinforced that image in subsequent films. For many, the Stoker character and Bela Lugosi’s representation of him merged to create the public image of Dracula. In future portrayals of Dracula, as frequently as not, the actor who played Dracula offered his interpretation of the Lugosi/Dracula persona, rather than the character presented in Stoker’s novel. Stoker’s novel was reprinted frequently in the following decades. Doubleday brought out the first American edition in 1899. After it entered the public domain, many reprints were published, along with condensed versions and adaptations for juvenile audiences. As early as 1972 a version for children, abridged by Nora Kramer, was published by Scholastic Book Services. At the same time, authors initiated efforts to create new interpretations of this highly intriguing literary figure. Prior to 1960, Dracula seems to have appeared in only one novel, in the 1928 Kasigli Voyvode (“The Impaling Vampire”) by Turkish writer Ali Riga Seifi. He was the subject of several short stories, such as Ralph Milne Fraley’s “Another Dracula,” which appeared in the September and October 1930 issues of Weird Tales. In 1960 two new Dracula novels, Otto Frederick’s Count Dracula’s Canadian Affair and Dean Owen’s The Brides of Dracula, were the first of more than 100 Dracula novels that would be published over the next three decades. Memorable among these are the several series of Dracula novels by Robert Lory (nine action stories), Fred Saberhagen (seven novels), and Peter Tremayne (three novels). Following the success of the Hammer Dracula movies, the vampire movie in general, and the Dracula vampire movie in particular, made a marked comeback. Over 100 movies have featured Dracula, and many others star vampires who are only thinly-veiled imitations. The first movie that attempted to bring the Dracula novel to the screen may have been a silent film made in Russia (1920), but no copy has survived. Following Nosferatu and the Bela Lugosi film, other versions have included Dracula (Spanish, 1931), Horror of Dracula (1958), El Conde Dracula (1970), Dracula (1979), and Bram Stoker’s Dracula (1992). Dracula has become the fictional character most often brought to the screen, with the possible exception of Sherlock Holmes. 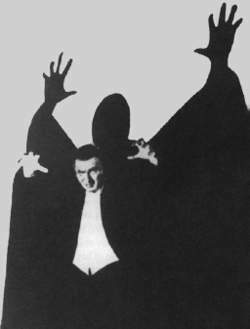 Dracula made his first television appearance in the 1960s through Bela Lugosi (who made a brief appearance as Dracula on the popular television series You Asked for It) and John Carradine, who appeared in a NBC production of the play. Other television specials that attempted to dramatize the novel featured Denholm Elliott (1971), Jack Palance (1973), and Louis Jourdan (1977). A comic contemporary Grandpa Count Dracula (portrayed by Al Lewis) was a regular character in the 1964–66 series The Munsters. During the 1990–91 season, a more serious and sinister count appeared briefly in his own Dracula—The Series. As early as 1953, Dracula was featured in comic books in Eerie’s (Avon Periodicals) adaptation of the novel. He made several appearances before vampires were banished in 1954 under the conditions of the Comics Code. During the period of banishment, Dell brought out one issue of a Dracula comic, but he mostly was limited to guest shots in humorous comics such as The Adventures of Jerry Lewis (July-August 1964), The Adventures of Bob Hope (October-November 1965), and Herbie (September 1966). Dracula did appear in several European and South American comic books, but it was not until the 1970s that he made his comeback in one of the most successful comics of the decade, The Tomb of Dracula. In this version, Marvel Comics brought Dracula into the contemporary world in conflict with the descendants of his antagonists in the Stoker novel. He soon got a second Marvel series, Dracula Lives!, and made numerous appearances in different Marvel comics as a guest villain. Most recently Dracula was the subject of two comic books from Topps. These grew out of the latest attempt to bring Dracula to the screen in Francis Ford Coppola‘s Bram Stoker’s Dracula. Dracula’s image (as portrayed by Lugosi) has been a favorite in merchandising, from candy labels to ads selling various products. Each October before Halloween his face graces greeting cards, posters, buttons, party favors, and miscellaneous paraphernalia. Many Dracula statues and dolls, in almost every medium, from artistic to cute, have been produced. Dracula also has been celebrated in music. As early as 1957, “Dinner with Drac” (Cameo, 1957) appeared on a hit record by John Zacherle. A 1950s humor album, Dracula’s Greatest Hits, had parodies of popular hit tunes that had been transformed into songs about Dracula. Dracula made a number of musical appearances through the 1960s and 1970s, primarily in comic situations, but in 1979 there emerged what would become known as the gothic subculture. That musical community was launched by the rock band Bauhaus, whose first hit was an eerie piece titled “Bela Lugosi’s Dead.” The gothic world found the vampire an apt symbol of the dark world they were creating, and Bela Lugosi’s Dracula served as a starting point for their funeral dress. Vlad, former leader of the gothic band Dark Theater, is a Lugosi/Dracula fan who not only adopted aspects of Lugosi’s persona into his own, but also created a shrine to Lugosi in the living room of his home. The permeation of the culture by Dracula during the last generation led to the formation of clubs and organizations that celebrated and promoted him. These include The Count Dracula Fan Club, The Count Dracula Society, The Dracula Society, and The Bram Stoker Society. As the centennial of the publication of Bram Stoker’s Dracula approached, Dracula had become one of the most recognizable images in all of popular culture. His popularity provided the base from which other popular vampire figures, such as Barnabas Collins and Lestat de Lioncourt, could evolve. Davidson, Carol Margaret, ed. Bram Stoker’s Dracula: Sucking through the Century, 1897–1997. Toronto: Durndun Press, 1997. 432 pp. Glut, Donald F. The Dracula Book. Metuchen, NJ: Scarecrow Press, 1975. 388 pp. Haining, Peter. The Dracula Centenary Book. London: Souvenir, 1987. 160 pp. Rpt. as The Dracula Scrapbook. Stamford, CT: Longmeadow Press, 1987. 160 pp. Rev. ed. : London: Chancellor Press, 1992. 160 pp. ———. The Dracula Scrapbook. New York: Bramwell House, 1976. 176 pp. Miller, Elizabeth. Reflections on Dracula: Ten Essays. White Rock, BC: Transylvania Press, 1997. 226 pp. Senf, Carol A., Dracula: Between Tradition and Modernism. New York: Twayne Publishers, 1998. 132 pp. Stoker, Bram. Dracula. Westminster, London: A. Constable & Co., 1897. 390 pp. 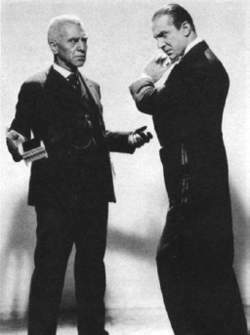 Edward Van Sloan (left) as Abraham Van Helsing, and Bela Lugosi as Dracula in a promo shot for the 1931 Tod Browning film. Poster art for 1931’s Dracula. In the wake of the success of the stage production of Dracula in New York in 1927, producer Horace Liveright (1886–1933) developed touring companies to take the play to various parts of the country. Actor Bela Lugosi, who had starred in the New York play, joined the West Coast company and eventually settled in Los Angeles where he could resume his film career. Then in 1930, Universal Pictures moved to purchase the film rights for Dracula from Florence Stoker. The original asking price, reportedly $200,000, was far too high from the studio’s perspective, so Bela Lugosi was cajoled into negotiating Stoker’s widow down to a more reasonable amount. Universal eventually got the rights for $40,000 and hired director Tod Browning to take charge of the project. Because of his role in negotiating the rights, Lugosi expected the part of Dracula would automatically be offered to him. It was not. Rather, Universal announced that John Wray, who had just had a major part in All’s Quiet on the Western Front, would play the role. Universal also considered Conrad Veidt (who declined the honor), Ian Keith, William Courtney, Paul Muni, Chester Morris, and Joseph Schildkraut. Not until a few weeks before shooting began did Lugosi secure the part. He sold his services for a special lower fee, and as a result was paid very little money—$3,500 for seven weeks of filming (about half of David Manners salary). Helen Chandler was chosen to play Mina Murray (now Mina Seward) and Frances Dale took the part of Lucy Westenra (changed to Weston). David Manners assumed the now greatly diminished role of Jonathan Harker. The other major part, R. N. Renfield, went to Dwight Frye. Edward Van Sloan, who had previously played Abraham Van Helsing, moved west for the movie part, and the cast was filled out by Herbert Bunston as Dr. John Seward. The movie was able to do much that the play could not. The film added the opening segment of the novel in which Jonathan Harker traveled to Transylvania and had his initial encounter with Dracula and his three brides. This chapter included what many consider the most dramatic moments of the book. However, in the movie, Renfield, not Harker, made the trip to Castle Dracula. His experiences there accounted for his “insane” behavior following his return to England. An elaborate set was developed for the memorable scenes in the castle but it was poorly utilized. Browning has been justly criticized for the restricted and flat manner in which he shot Dracula’s encounter with his English guest, so ripe with possibilities. In spite of Browning’s limitations, however, the scenes that began with Lugosi’s opening line, “I am … Dracula,” are among the most memorable, powerful, and influential in horror film. Dracula also included a brief scene aboard the Demeter, the ship that brought Dracula to England. From this point, the film rejoined the revised version of the Hamilton Deane/John L. Balderston play. Dracula had moved to London and targeted Mina Seward after previously disposing of Lucy. He abducted her to Carfax, now transformed into Carfax Abbey, his London home, but was tracked by Van Helsing, Dr. Seward, and Harker and finally destroyed. As in the play, the closing chapters of the book, describing the return to Transylvania, were deleted. Also, true to the play, at the end Van Helsing stopped the credits and made the famous closing speech on the reality of vampires. Dracula was set to open on Friday, February 13, 1931, at the Roxy Theater in Manhattan. New York was plastered with blood-red signs. Papers on the West Coast panned the production. The Los Angeles Times dubbed it a freak show—a curiosity without the possibility of wide appeal. The New York coverage was mixed. Critics did not like it, but also had to respond to Universal’s intense publicity and advertising campaign. The run at the Roxy lasted only eight days. The national release came in March. A silent version was prepared for theaters that had not yet added sound equipment. (Also, to make full use of the expensive set, a Spanish-language version with a completely new cast was filmed simultaneously with the Lugosi English-language version.) The movie opened in Los Angeles with no fanfare because Universal was in the midst of a budget crunch. In spite of its slow start, Dracula (the first of what would become a lineage of horror talkies) caught the imagination of the public and became the largest grossing film for Universal that year. For the first time since the Depression had started, the studio, threatened with closing, made a profit. Today, two generations after its release, some assessment of Universal’s Dracula is possible. Certainly, it is the most influential vampire film of all time. All subsequent performances of the vampire have been either based upon it or a direct reaction to it. However, its original success did not lead, at least immediately, to a second vampire movie, but to the production of a very different horror movie, Frankenstein, and a string of horror movies covering various themes. Additionally, its continued success through the years did not lead to the production of many more vampire movies, which appeared only sporadically until the 1960s. In the 1960s, however, the vampire genre was discovered as a unique creation, not just another variation on the horror genre. Beginning with Horror of Dracula (1958), Hammer Films’s remake of Dracula starring Christopher Lee, the novel Dracula has been adapted to the screen more than twenty-five times, the character Dracula has appeared in more than one hundre films, and characters largely based on Dracula have been featured in several hundred more. The more important remakes of the Dracula novel after the first Lee version included El Conde Dracula (1970), also with Lee; Dracula (1973) with Jack Palance; Count Dracula (1978) with Louis Jourdan; Dracula (1979) starring Frank Langella; Nosferatu (1984); and director Francis Ford Coppola‘s Bram Stoker’s Dracula (1992). Ranking with each of these was the delightful satire/comedy Love at First Bite (1979), starring George Hamilton. Non-English versions of Dracula were produced in Turkey (Drakula Istanbula, 1953), Korea (The Bad Flower, 1961), Pakistan (Zinda Laash, 1967), Spain (El Conde Dracula, 1970), Japan (Lake of Dracula, 1970), and Italy (Dracula’s Curse, 2002). Everson, William K. Classics of the Horror Film. New York: Citadel Press, 1974. 274 pp. Glut, Donald. The Dracula Book. Metuchen, NJ: Scarecrow Press, 1975. 388 pp. Holte, James Craig. Dracula in the Dark: The Dracula Film Adaptations. Westport, CT: Greenwood Press, 1997. 161 pp. Madison, Bob, ed. Dracula: The First Hundred Years. Baltimore, MD: Midnight Marquee Press, 1997. 322 pp. MagicImage Filmbooks Presents Dracula (The Original 1931 Shooting Script). Atlantic City, NJ: MagicImage Filmbooks, 1990. Skal, David J. Hollywood Gothic: The Tangled Web of Dracula from the Novel to Stage to Screen. New York: W. W. Norton & Company, 1990. 242 pp. 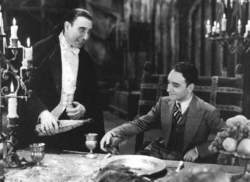 Dracula (Carlos Villerias) pours a glass of wine for Jonathan Harker in the 1931 Spanish film Juan. At the same time Universal Pictures produced its famous version of Dracula starring Bela Lugosi, it produced a second version in Spanish. The Spanish version grew out of the studio’s decision to respond to the changes brought about by the addition of sound to movies. Universal received a high percentage of its revenue from the foreign distribution of silent films, but talkies in English could threaten revenue because the techniques of dubbing had yet to be perfected. Universal’s Czechoslovakian-born executive Paul Kohner suggested a solution to the studio’s head, Carl Laemmle, Jr.: shoot foreign language versions of motion pictures simultaneously with the English versions, thus cutting costs by using the sets more than once. Kohner also argued that salaries for foreign actors and actresses were far less than those of Americans. Laemmle appointed Kohner head of foreign productions. The first result was a Spanish version of The Cat Creeps, a talkie remake of The Cat and the Canary, which Univeral had originally done as a silent film. Released in 1930 as La Voluntad del Muerto, it was an overwhelming success in Mexico and made actress Lupita Tovar a star. Kohner decided to make a Spanish version of Dracula and moved quickly to secure the youthful Tovar for the lead before she could return to Mexico. He chose Carlos Villarias (or Villar) for the role of Dracula, and secured a capable supporting cast with Barry Norton (“Juan” or Jonathan Harker), Eduardo Arozamena (Abraham Van Helsing), and Pablo Alvarez Rubio (R. N. Renfield). Though it continued to be shown in Latin American countries into the 1950s, the Spanish version of Dracula became a largely forgotten entity in the United States. Universal failed to register its copyright of the film and did not make extra copies to preserve it. Donald F. Glut‘s 1975 work on Dracula mentioned it only in passing. In 1977, the American Film Institute attempted to make an archival print, but the only copy available (at the Library of Congress) had a decomposed third reel. In 1989, author David J. Skal followed up a rumor that a copy had survived in Cuba. He was able to facilitate the preparation of a copy, which was presented in the United States for the first time since the 1930s. The showing took place on Halloween, 1992 at the University of California at Los Angeles. The Spanish version followed the same script as the Lugosi version. However, as Skal noted, it was very different in that the more mobile camera movement employed by director George Melford and his shooting team gave it a much livelier quality. Both mood and action were enhanced. It stands as “an almost shot-by-shot scathing critique of the Browning (Lugosi) version,” said Skal. The film opened in Mexico City and New York in April 1931 and in Los Angeles in May. It was one of the last Spanish-language films made in Hollywood—such productions being discontinued in the post-Depression business atmosphere. While possibly the superior movie, there is very little chance, given the development of the vampire film, that more than a few film historians and vampire buffs will ever see it. In spite of its being released for home video (later on DVD), and becoming somewhat of a best seller in that media, the film has become a historical curiosity rather than an important and influential film. Turan, Kenneth. “The Missing ‘Dracula.’” Los Angeles Times (October 31, 1992). In 1973 producer-director Dan Curtis, who had great success with vampire Barnabas Collins in the daytime television series Dark Shadows, teamed with screenwriter Richard Matheson (best known for his science fiction vampire novel I Am Legend) to produce a new version of Dracula for television. The pair attempted to bypass both the play by Hamilton Deane and John L. Balderston (the basis for the version of Dracula  with Bela Lugosi) as well as Horror of Dracula and the other Hammer Films productions with Christopher Lee. At the same time, they were strongly influenced by the work of Raymond T. McNally and Radu Florescu, who published In Search of Dracula: A True History of Dracula and Vampire Legends (1972). This was the first book to highlight the exploits of Vlad the Impaler, the historical person who stands, in part, behind the lead character in Bram Stoker‘s novel. Curtis’s Dracula was preeminently the fifteenth-century Wallachian ruler and military hero, still alive in the nineteenth century. The painting of him, astride his horse, dominated a room of Castle Dracula and in several scenes stole the attention of the camera. In the corner of the painting, a young woman was pictured. This woman was Dracula’s true love (or true passion) from the fifteenth century, who had not survived with him into the nineteenth century. Very early in the movie, Dracula saw a picture of Jonathan Harker, Mina Murray, Arthur Holmwood, and Lucy Westenra. Lucy looked nearly identical to the woman in the painting, so Dracula immediately decided that he must possess her. His quest for Lucy dominated the action in the first part of the film, while revenge for her death (the second time his love had been taken from him) occupied the remainder of the show. Curtis choose veteran character actor Jack Palance as Dracula. The story began with Jonathan Harker (Murray Brown) traveling to Transylvania. There he moved through forbidden portions of the castle and discovered Dracula’s secret. As Dracula departed for England, Harker was left behind to be bitten by Dracula’s brides. In England the action centered on the two women, Lucy (Fiona Lewis) and Mina (Penelope Horner), Lucy’s fiance Arthur Holmwood (Simon Ward), and most importantly, Abraham Van Helsing (Nigel Davenport). The novel’s subplot concerning Dr. John Seward and the insane R. N. Renfield were pushed aside. Van Helsing came to the fore after Lucy was bitten by Dracula. It was his task (Holmwood was unable to face his duty) to drive the stake into her heart. With his true love dead again, Dracula turned on Mina. Eventually, Van Helsing and Holmwood acted together. They drove Dracula back to Transylvania and followed him to Castle Dracula. One by one they faced and defeated the three vampire brides, Jonathan Harker (who had become a vampire and had to be killed), and finally Dracula himself. Dracula was first weakened by letting in the sunlight (as he was killed in Horror of Dracula). Then Van Helsing grabbed a spike from a suit of armor and impaled him. Dracula thus suffered the same fate that he was said to have inflicted on so many others. The Jack Palance/Dan Curtis Dracula was viewed by a national television audience and has been cited as a more than competent version of the familiar tale. However, it never gained the following of the Hammer Films and was subsequently eclipsed by the Frank Langella/John Badham Dracula (1979) and Bram Stoker’s Dracula (1992). Waller, Gregory A. The Living and the Undead: From Stoker’s Dracula to Romero’s Dawn of the Dead. Urbana, IL: University of Illinois Press, 1986. 376 pp. In 1979 Universal Pictures replayed a scenario that first occurred a half century before when it again filmed a version of the Hamilton Deane/John L. Balderston production of Dracula, the Vampire Play in Three Acts. In the original case, Universal purchased the film rights to the play following its successful run on Broadway and in touring companies around the country. In 1978 it reacted to the award-winning Broadway revival of the play starring Frank Langella. Universal had stayed away from the wave of quickie vampire movies, the production of which reached a new high in the 1970s, and it turned the new Dracula into a lavish production. The film opened with the wreck of Demeter, the ship that transported Dracula to the English town of Whitby. These scenes, merely alluded to in the play, were filmed on the coast of Cornwall. Safely on land, Dracula then proceeded to invade the household of Dr. John Seward (Donald Pleasence), whom Balderston had turned from a young suitor into the middle-aged father of Lucy Westenra (now Lucy Seward). When Mina Murray (now Mina Van Helsing) died under mysterious circumstances, Seward called Mina’s father, Dr. Abraham Van Helsing (played by the equally eminent Laurence Olivier), to assist him in handling the problem of Dracula. The distinctive difference of the Langella version was its underlying understanding of the relation of sexuality and horror. Dracula was the object of horror—the undead. Yet as he entered the Seward household, he did not accomplish his goals by brute force. He fell in love first with Mina and then with Lucy. He won them over when his sensuality attracted their attention, and he then completely seduced them. Dracula’s triumph occurred when he invaded Lucy’s bedroom and shared his blood with her, in as sensual a scene as could be found in any vampire movie. Subsequently Lucy, completely captivated by Dracula’s magnetism, rushed off to Carfax to join him. This version of Dracula offered a new twist to Dracula’s eventual destruction. He attempted to escape England, accompanied by a very willing Lucy, but Van Helsing and the other men were in pursuit. They finally caught up with Dracula on the ship, where he emerged from his coffin to battle the forces of good. In the end he was impaled on a hook and hoisted high into the air to be burned to death in the sunlight. The film got mixed reviews. Some applauded its sensual quality, while others saw it as an empty parody of the vampire movie. Interestingly enough, it appeared during the same year as the best and most successful of the several Dracula spoofs, Love at First Bite. In spite of its mixed reception, the Langella film took its place as one of the better and more interesting of the Dracula remakes. Allen, Thomas. “Yeh, But Did He Die?” The Long Island Catholic (July 26, 1979). Arnold, James W. “‘Dracula’—Another Day at the Blood Bank.” The Catholic Herald Citizen (August 4, 1979). Ebert, Roger. “Dracula: Revival of the Undead Hero.” Chicago Sun-Times (July 8, 1979). In 1962, Dell Publishing Co., Inc., which did not subscribe to the 1954 Comics Code prohibiting vampires, issued a comic book titled Dracula that told the story of a contemporary encounter with a revived Count Dracula at his castle in Transylvania. The title was discontinued after the first issue. Four years later, however, in November 1966, a new Dracula comic book appeared. The initial issue continued the numbering of the previous Dracula volume but began what amounted to an entirely new storyline. At Castle Dracula in Transylvania, a present-day Count Dracula was working in a modern laboratory on a serum derived from bats that was to aid in the healing of brain damage. He completed the serum, but some of it accidently dripped into his glass. When he drank from the glass, he was changed into a bat. In this story, there was no mention of vampires or vampirism. Rather, Count Dracula blamed his problems on vampire bats whose bad image had haunted his family. By removing the superstitions of the bat from his family’s name, he had hoped to come out of hiding and lead a productive life. After consuming the serum, Dracula had to alter his plans to aid humanity. As he was contemplating his future, representatives of the new dictatorial government moved in to take over his castle. Dracula then decided to fight the evil he now saw all around him. He had the ability to change into a bat, and his supersensitive brain could control bats. He began a body-building program and had a new suit made with batlike features. Dracula emerged as a new superhero, which at the time was not yet in vast supply. Count Dracula also moved to the United States and assumed the name Al. U. Card. His first task was to defeat a plan to change the world’s weather. In the United States he took over an abandoned radar control site as an underground laboratory and headquarters. He also saved a young woman, B. B. Beebbe, who drank some of the formula and became his partner. She called herself Fleeta (from “fliedermaus,” German for “bat”). The series survived for three issues in 1966–67 and then was discontinued. In 1972, following the revisions of the Comics Code and the appearance of several successful vampire comic books, Dracula was revived for a third time and issues 2–4 were reprinted as issues 6–8. However, the character never caught on and after issue 8 the series was discontinued again. Dracula. No. 1–8. New York: Dell Publishing Co., Inc., 1962, 1966–67, 1972–73. Rovin, Jeff. The Encyclopedia of Superheroes. New York: Facts on File, 1986. 443 pp. 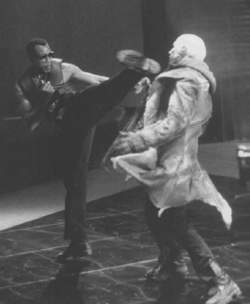 Wesley Snipes brings the comic book vampire hero Blade to life on the screen. Immediately after the Comics Code was revised in 1972 (lifting the ban on vampires that had been in effect since 1954), Marvel Comics moved to issue several horror titles that fell within the new guidelines. One of these was a series based on Count Dracula. The Tomb of Dracula, which devised a completely new set of adventures for the count, and became one of the most successful vampire-oriented comic books of the century. The central hero was Frank Drake, a descendant of the count, whose family had abandoned the family estate and anglicized their name. Drake had inherited the family fortune but quickly squandered it. Destitute, his only asset was Castle Dracula. As the story opened, Drake traveled to Transylvania to see the castle with the idea of either selling it or turning it into a tourist attraction. Accompanying him were his girlfriend Jeanie and another friend, Clifton Graves, who had originally suggested the possible value of the castle. As they explored the castle, Graves discovered the crypt containing the remains of Dracula, complete with the stake in his heart. Graves pulled out the stake, thus awakening the count. Dracula confronted Drake and Jeanie but was driven off by her silver compact. While the pair considered the implication of the encounter, Dracula fled to the nearby town to find fresh blood. After the townspeople found the body of Dracula’s first victim, they marched on the castle and set fire to it. Drake, Jeanie, and Graves went back to London, and the count followed. Drake sold the Transylvania property but his more immediate problem was that Jeanie had been bitten by Dracula and was now a vampire. During Drake’s next confrontation with the count, Jeanie was killed. Distraught, Drake attempted suicide. He was stopped by Rachel Van Helsing, granddaughter of Abraham Van Helsing, who also had dedicated her life as a vampire hunter. Taj, a mute Asian Indian, accompanied her. Rachel Van Helsing carried a crossbow whose wooden arrows amounted to wooden stakes. Together, the three set out to kill Dracula. They were soon joined by two more vampire fighters, Quincy—not the same Quincy as in the novel—Harker (the son of Jonathan Harker and Mina Murray mentioned in the last paragraphs of the novel), and Blade, the Vampire Slayer, an African American whose mother had been killed by a vampire. A generation older than either Drake or Van Helsing, Harker used a wheelchair equipped with devices such as a weighted net and a cannon that fired poisoned wooden darts. Blade’s major weapon was a set of wooden knives. Later in the series, Hannibal King, a detective who had been turned into a vampire, allied himself with the team. He and Blade had their initial encounter not with Dracula, but with Deacon Frost, another vampire from Blade’s past. The team fought Dracula for a decade, through seventy issues of The Tomb of Dracula. Dracula was portrayed very much as he was in popular lore. He was evil, but with some traits of human feeling, pining over love betrayed and the capture of his son by the forces of good. Drake, Van Helsing, Harker, and Blade fought him with wooden stakes (their most consistently effective tool), the crucifix, silver, fire, and daylight. While there were partial victories on both sides, each defeated character recovered to carry the series to its conclusion. For example, very early in the series Dracula was killed, but he was brought back to life. Later in the series he lost his vampiric powers for a time. As was common in Marvel Comics, Dracula made appearances in other Marvel titles (Dr. Strange, Frankenstein, Thor) and several of the Marvel characters (Silver Surfer, Werewolf by Night) appeared in The Tomb of Dracula to offer their services to defeat him. The Marvel Dracula was strongly affected by the Hammer Dracula movies in one respect. Those bitten by Dracula died and immediately became vampires. In the novel, they were merely weakened by their first encounter. The Tomb of Dracula concluded in issue 70 with what appeared to be Dracula’s definitive death. He was killed in a confrontation with Quincy Harker, who impaled him with a silver spoke from his wheelchair. Harker also cut off Dracula’s head, stuffed his mouth with garlic, and buried both himself and Dracula under stones dislodged from Castle Dracula in an explosion. However, the Count was quickly revived in the new series of The Tomb of Dracula issued by Marvel in a black-and-white magazine format (not covered by the revised Comics Code). When his body was discovered and the silver spoke removed, Dracula was freed for further adventures. He starred in the revived series of The Tomb of Dracula, which lasted for six issues. Over the next few years he also made guest appearances as the villain in several Marvel Comics. For example, in 1983 he had a confrontation with Dr. Strange, the super-hero with magical powers. Dr. Strange invoked what was termed the Montesi Formula, a magical incantation designed to destroy all the vampires in the world. Dracula disintegrated in the process. Hannibal King, who had never ingested human blood, was turned back into a normal man by the same process. By the beginning of the 1990s, the Montesi Formula had weakened and vampires began to reappear in the Marvel Universe. While most of the vampires killed in 1983 remained dead, the old and powerful vampire Dracula was resurrected and made his first appearance in No. 10 of Dr. Strange Sorcerer Supreme in November 1989. Then in 1991, the The Tomb of Dracula was revived a third time by writer Marv Wolfman and artist Gene Colan, for four issues published by Epic Comics, a Marvel subsidiary. The story picked up the lives of Drake and Blade ten years after the death of Dracula at the hands of Quincey Harker. Drake had continued to suffer psychological upset as he tried to deal with his own ancestry, his problems with females, and his immediate need to deal with the return of Dracula to life. They put Dracula away again, but the never-dead-for-long vampire would return in 1994 to bedevil Drake and Blade again in their further adventures as the Night-stalkers. Since then, Dracula has been a visiting villain in various Marvel comics. Doctor Strange. No. 62 New York: Marvel Comics, December 1983. Sienkiewicz, Bill. “Dracula.” The Official Handbook of the Marvel Universe 2, 17 (August 1987): 10–13. The Tomb of Dracula. Nos. 1–70. New York: Marvel Comics, 1971–79. The Tomb of Dracula. Nos. 1–6, New York: Marvel Comics, 1979–80. The Tomb of Dracula. Nos. 1–4. New York: Epic Comics, 1991–92. Dracula author Stoker was born in the seafront suburb of Clontarf, as his legacy is celebrated with this immersive theatrical performance that's part show and part museum, but all blood-curdling fun. But, as it will have twice the number of episodes next season, it will hopefully reach its much-desired resolution, that eventual climactic showdown with the rampaging Dracula. Dacre Stoker, great grand-nephew of Bram Stoker, said that staging Halloween night in Dracula castle In was a way of "giving people a good experience and a good scare". The character is just so present, I can't imagine there not being a Dracula. 2 2FRANK Langella offered a dark, forbidden Dracula in the 1979 movie version which also starred Laurence Olivier, Kate Nelligan and Trevor Eve. According to David, who has been artistic director since 2001, the story behind Dracula is a blend of horror and sensuality and poses many questions. Home base was the NBC Dracula FB page, I "liked" the FB page shortly after the 1st episode aired. Either way, Dracula was relatively fearless -- and the intense descriptions of violence, and the author's skill at contrasting reality with fantasy will draw mature young readers into a fascinating story that seems like fiction, but is historical fact. Dracula does not exist, he is the monster - Vlad Tepes and Alexander do exist. Anno Dracula: Johnny Alucard offers a new addition to the Anno Dracula series the first in over a decade--and follows several other new additions to pair literary references with an alternative history story in which the heroes of Stoker's original Dracula fail to stop the Count's conquest of England. Abraham "Bram" Stoker (8 November 1847-20 April 1912) was an Irish novelist and short story writer, best known today for his 1897 Gothic novel Dracula. 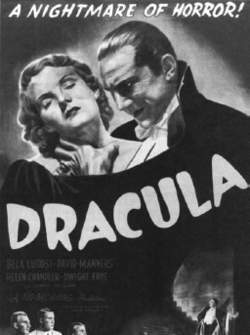 Gillmore falls in love with a woman named Magdalena, but is unaware of the fact that Dracula has also feelings for her.